Casa Romero i Havana, Cuba: Bestill nå! 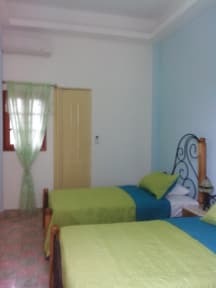 Casa Romero in Havana Center is a modern, elegant, bright, airy, comfortable and independent apartment with WIFI available throughout the house. It offers two air conditioned rooms with independent bathroom, living room, dinning room, kitchen and balcony, with an extensive view where you can see the Capitol, accessed from the living room, the kitchen and dining room and one of the rooms, inside combine materials such as wood, marble and iron. The kitchen is for use by the owners, to prepare breakfast, lunch and dinner if you wish. The terrace is a common area, where it can take bathrooms of sun and pictures of the impressive views that there they are sighted. The Owners are young people, educated, communicative, sociable and pleasant with desires to learn and show customs. 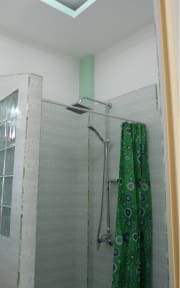 The property is in Center Havana, a calm neighbourhood, full with charms and multiple architectures. Has a strategic position, because you can arrive walking to different places. As to the old Havana until the modern Havana, call Vedado. We have two private rooms, comfortable, elegant in their decoration, air-conditioned, with independent bathroom, hot water, safe box, 110/220v, minibar, hair dryer, parasol, dressing room table, hangers. The room 1, with a matrimonial bed. The room 2, with exit to the balcony, has two private beds. Services: Breakfast, lunch and dinner, parking, laundry, guide tour, dance class, withdrawal airport, transfer to other cities.